Trolls lurk under bridges waiting to eat children, threaten hobbits in Middle-Earth, and invade the dungeons of Hogwarts. Often they are depicted as stupid, slow, and ugly creatures, but they also appear as comforting characters in some children’s stories or as plastic dolls with bright, fuzzy hair. Today, the name of this fantastic being from Scandinavia has found a wider reach: it is the word for the homeless in California and slang for the antagonizing and sometimes cruel people on the Internet. But how did trolls go from folktales to the World Wide Web? 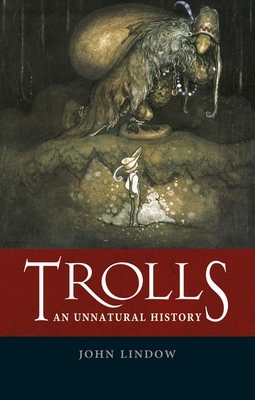 To explain why trolls still hold our interest, John Lindow goes back to their first appearances in Scandinavian folklore, where they were beings in nature living beside a preindustrial society of small-scale farming and fishing. He explores reports of actual encounters with trolls—meetings others found plausible in spite of their better judgment—and follows trolls’ natural transition from folktales to other domains in popular culture. Trolls, Lindow argues, would not continue to appeal to our imaginations today if they had not made the jump to illustrations in Nordic books and Scandinavian literature and drama. From the Moomins to Brothers Grimm and Three Billy Goats Gruff to cartoons, fantasy novels, and social media, Lindow considers the panoply of trolls that surround us and their sometimes troubling connotations in the contemporary world. Taking readers into Norwegian music and film and even Yahoo Finance chat rooms, Trolls is a fun and fascinating book about these strange creatures. John Lindow is professor of Scandinavian at the University of California, Berkeley, and the author of Norse Mythology: A Guide to Gods, Heroes, Rituals, and Beliefs and Medieval Folklore: A Guide to Myths, Legends, Tales, Beliefs, and Customs.